One of the biggest challenges that we face in economic development today is how to effectively build communities that will produce successful families and individuals. Economic developers work relentlessly to create economic opportunities, but it is increasingly difficult to achieve economic inclusion and mobility for individuals in the lower income strata. In order to make places better for everyone over the long-run, economic developers need to be thinking differently about who the jobs that we create are for. Should we be focused on high paying jobs or should we also be focused on jobs and investment that can impact the lives of current residents, or even target people who have been left behind? This creates some challenges as our work has not historically been oriented that way, but in order to move forward and make changes these questions must be asked. Achieving more diverse and equitable outcomes in our communities will require making new relationships with organizations that economic development organizations may not have formally engaged with in the past. Oftentimes investing in more distressed areas may be harder and take a longer time, but thinking differently about metrics and goals will be required in order to make any strides whatsoever. Keeping this perspective will help hold us accountable to the whole community. Attracting LGBT: A Key Piece in Today's Economic Development Puzzle: This session will delve deeper into how communities have grown economically by creating inclusive environments for the LGBT community. Explore the correlation between the inclusion of LGBT individuals and the economic vitality of a community. This session will include case studies of LGBT-friendly communities benefiting in terms of talent attraction, high-paying industries, and tourism growth. Addressing Economic Inequalities in Your Community: This session will give guidance on data collection, assessment tools and forming a strategic action plan. You will hear from economic developers about programs that have proven successful in their communities and the economic costs to a community when disparity exists. How to assess economic equity in your communities and tips on developing strategic action plans and an examination of best practices nationwide will also be covered. IEDC EDRP Session on Inequality Research Paper: Though the Great Recession has long been in the rearview mirror, many workers have not benefited from the subsequent recovery. IEDC's Economic Development Research Partners has undertaken a paper to study the issue of economic opportunity and identify what economic developers can do to create an inclusive economy. Attend this session to hear key findings from the paper, as well as case studies from communities that have undertaken successful initiatives to ensure broad-based prosperity. From the Ground Up: Economic Growth and Community Renewal: This session will look at case studies of communities that are implementing everything from quick fixes to longer-term strategies in the hopes of sparking community revitalization and economic growth. You'll hear in-depth details on how these economic developers have used grassroots efforts and creative thinking to achieve economic development success. Outside of the Annual Conference, IEDC will be providing an Attracting Investment to Disinvested Corridors and Neighborhoods Webinar on June 29 from 2:30 pm to 4:00 pm ET. In this Webinar, learn how you and your community can attract investment to disinvested areas, grow your local economy and tax bases, and economically empower your residents and businesses to their maximum potential. You will hear about the complex historical and present investment barriers in disinvested areas, case studies and strategies of how your community can approach breaking the cycle of disinvestment, and how commercial development, revitalization, and stabilization can spur investment. As we look forward to the Annual Conference, I would like to reflect on the most important advice I can give after my years in economic development. We must all continue to focus on always doing the right thing within our field. Economic development has taken a lot of hits in terms of old school thinking with back door deals and secrecy, so we must continue to work to maintain the highest standards of integrity and transparency in decision making. This is a highly networked field and it’s very important to maintain your reputation by working very honestly, ethically and collaboratively. IEDC allows all of us to maintain and grow within these networks. As we move forward in our economic development careers, we should all continue to think about how our work will help to change and build the country in a new way. I hope to see you all at the Annual Conference in Cleveland! Select the " " icon to learn more about a blog. How Will You Celebrate Economic Development Week? This year, IEDC is commemorating its 90th anniversary as the largest professional membership organization for economic developers. May 8 marks the date of the merger between the American Economic Development Council and the Council for Urban Economic Development in 2001. During the week of May 8-14, Economic Development Week (PDF), economic developers from throughout the world will be celebrating the industry as a profession. It’s a great time to recognize the long-term impact that this profession has had on job creation, new investment and improving communities. Celebrating Economic Development Week gives communities an opportunity to showcase the results of positive collaboration and continued partnerships. It also provides a forum for educating elected officials, community leaders and residents on the importance of supporting economic development efforts. Our County Board of Commissioners and City Council passed resolutions announcing May 8-14 as economic development week and recognizing the strong, long-term relationship that they have shared with our organization. That week is also important for the Great Lakes Bay Region, as we will host a site consultant for meetings and tours of our eight-county collaborative. We will also be issuing a press release on our activities, presenting recent developments at the Saginaw County Chamber of Commerce’s Percolator Breakfast and meeting with our contributors to discuss current success and future plans. Many other communities are already making celebration plans, as well. GROW Licking County (Ohio) is among the first EDOs to organize Economic Development Week events. Its two-day ED101 Connect series will focus on educating the community on the importance of the economic development profession. "The intent of this series is to provide a critical baseline of education to our county's leadership," Licking County Commissioner's Office President Tim Bubb said. "Through this dialogue, we hope to promote a fuller understanding of economic development and its role with various elected boards throughout Licking County." ED101 Connect will cover best practices, stories of successes and shortfalls, as well as the importance of collaboration in economic development. Seminars will strive to create a core of “in-the-know” community leaders, entrepreneurs, and business professionals by arming them with essential knowledge to improve infrastructure, attract and retain business, and sustain a healthy local economy. Tulare County Economic Development Corporation (California) will spread the news through its stakeholder update videos and will introduce resolutions to be adopted by county officials recognizing Economic Development Week. • Greater Richmond Partnership (Virginia) has organized an Economic Development Partners Lunch & Learn on May 8, and will participate in several events throughout the week. • Greater MSP, (Minneapolis - St. Paul, Minnesota) along with IEDC President & CEO Jeff Finkle, CEcD, will host an event to recognize those executives and government officials involved in rolling out the Minnesota Medical Manufacturing Partnership (MMMP). • Grow St. Charles (Missouri) has passed a City Council resolution of support, and has requested a proclamation from Missouri Governor Jay Nixon. Nichols of the City of Cleveland for a press conference to formally announce Economic Development Week, as well as IEDC’s Annual Conference, held September 25-28 in Cleveland, Ohio. IEDC has also launched a new award for Economic Development Week called the Innovation in Economic Development Week Award. This award will highlight effective promotion and celebration of Economic Development Week in communities. There is no cost to enter the contest, but the activities that communities highlight in their entries must have been completed during the week of May 8-14. The deadline to apply for the award is June 10. Download the Innovation in Economic Development Week entry packet to get started. I look forward to seeing how you will choose to celebrate the many accomplishments we have seen throughout the economic development profession. Cheers to 90 years! 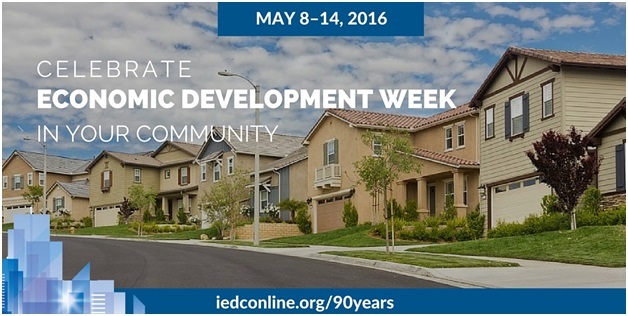 See tips and what other communities are doing in this IEDC SlideShare about Economic Development Week. The concept and practice of economic development has rapidly evolved over the past century. From its early industrial roots in “big game hunting” and “smokestack chasing”, to a more comprehensive approach that includes entrepreneurship, innovation, and global competitiveness, a lot has happened over the decades. Throughout the economic transformations of the 20th and 21st centuries, economic developers have been essential players in helping communities grow and prosper. IEDC continues to lead the way. While the profession has evolved to meet new challenges, many core competencies and tools remain. As Judie Scalise (AEDC chair, 1993-94) has said, “Community leaders recognize that in order to be successful you need to leverage your assets and improve the foundations that support economic development. The skill set that economic development practitioners need to do their jobs has expanded.” IEDC serves the essential role of keeping its members educated and proficient in state-of-the-art economic development techniques. Today, the economic development landscape has notably been impacted by an uneven economic recovery following the Great Recession. Demographic shifts, aging infrastructure, globalization, sustainability concerns, transformations in the labor market, burgeoning entrepreneurship, and natural disasters are some of the many elements influencing the economic development profession and will continue to do so in the near future. - Partnerships with diverse stakeholders. There’s more to hear about this topic. Find out what’s taking place this year at the Economic Future Forum in Tulsa, Oklahoma, from June 12-14. This conference will focus on four pillars of economic development strategy to transform a community to be globally competitive in the 21st Century. As a result of the AEDC and CUED merger of 2001, 2016 allows IEDC to celebrate 90 years of history making in the economic development industry. 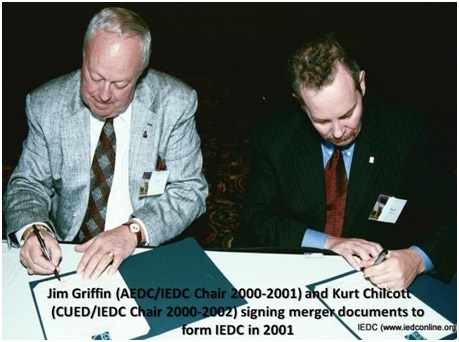 As a result of the AEDC and CUED merger of 2001, 2016 allows IEDC to celebrate 90 years of history making in the economic development industry. As part of our celebration activities, we have started this new blog that will be included within IEDC News and housed on our website at www.iedconline.org/edblog. A number of topics will be covered in this space and it will feature a different writer each month. We’ll be focusing on keeping you informed of newsworthy events impacting economic development, ways to get more involved within the economic development community, and IEDC events to further your experience and education within economic development. Today I would like to tell you about our upcoming events. Economic development is a broad industry that impacts nearly everyone, so we aim to host a wide range of events that will appeal and be relevant to as many of our members as possible. Every community is dealing with different issues and we aim to bring like-minded economic development professionals from all over the world together, allowing them to share their ideas and problem-solve in a way that otherwise would not be possible. The AEDC/CUED merger took place during the week of May 8-14, which is how we chose the dates for our first ever Economic Development Week. The primary purpose of Economic Development Week is to celebrate both the achievements of economic developers and the industry’s impact on cities, towns and the world at large. Economic Development Week will consist of online activities designed to highlight the importance of economic development and recognize the efforts of economic development professionals in all corners of the world. We encourage communities to get involved and take part in the celebration. A celebration guide has been created for your use. It includes sample city, county and state resolutions, a sample press release, and sample ads. I encourage you to download the ad templates, add your community’s name and URL and begin sharing them to bring greater awareness to the role of the economic developer and the profession. IEDC is already receiving preliminary plans from communities and we will be sharing them on our social media platforms over the coming months. Send your plans to Ania Soltan (asoltan@iedconline.org) and we may just feature you in an upcoming campaign. After Economic Development Week, we will be looking ahead to the future with our Economic Future Forum conference taking place in Tulsa, OK from June 12-14. This conference will focus on the pillars of future economic development: prosperity, skills, innovation, and livability. Did you know that Tulsa consistently ranks as one of the top 10 cities for young professionals and young entrepreneurs? Cities struggle with attracting and retaining a younger professional workforce, and Tulsa is doing it. We will draw inspiration from the plan Tulsa has for their economic development future as we explore how private sector development, workforce and education, entrepreneurs, small businesses, and community development all support broad-based economic growth and quality of life. Register for Future Forum here. The earlybird deadline is March 18. This bring us to IEDC’s 2016 Annual Conference in Cleveland, Ohio from September 25-28th. The theme will be “Ready to Rock: Economic Development through Technology, Innovation and Productivity.” The conference will explore the idea that economic development within a community inevitably goes through ups and downs, but having a team that acknowledges the challenges, opportunities, and future areas of growth will allow the community to thrive. Register for 2016 Annual Conference here. The earlybird deadline is July 1. An exciting element of our annual conference will be IEDC's Excellence in Economic Development Awards program. These awards highlight the world's best economic development programs and partnerships, marketing materials, as well as the year's most influential leaders. Organizations and individuals will be honored for their efforts in creating positive change in urban, suburban and rural communities. Winners will be recognized at the 2016 Annual Conference. Submit an application here. The deadline to submit is May 13. We have a lot to celebrate during this special 90th anniversary year, and I look forward to doing so with all of you!